Strawberry Bread a delicious Homemade sweet loaf made with fresh strawberries and topped with a creamy strawberry glaze. 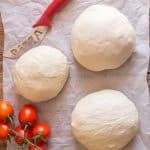 The perfect Summer Quick Bread. 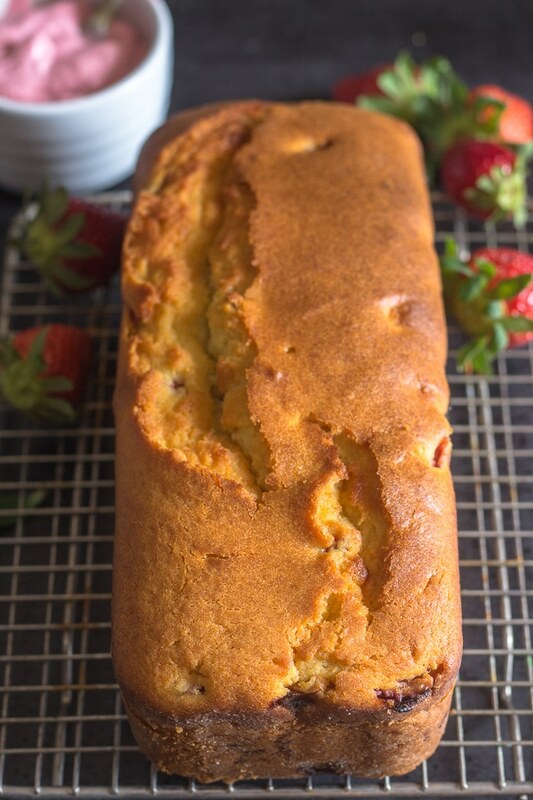 I made this Strawberry Sweet Bread a few months ago back in Italy when Strawberries had just come out. Since I had already posted a few Strawberry Recipes this year, I thought I would hold onto this one until next summer. But after being in Toronto for the past month, and walking all over the city and checking out farmer’s Markets and outdoor fruit grocers I decided that Strawberries were still very much on everyones minds and food lists. 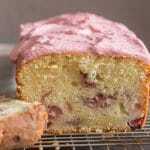 So therefore, I give you a Homemade Fresh Strawberry Bread Recipe. 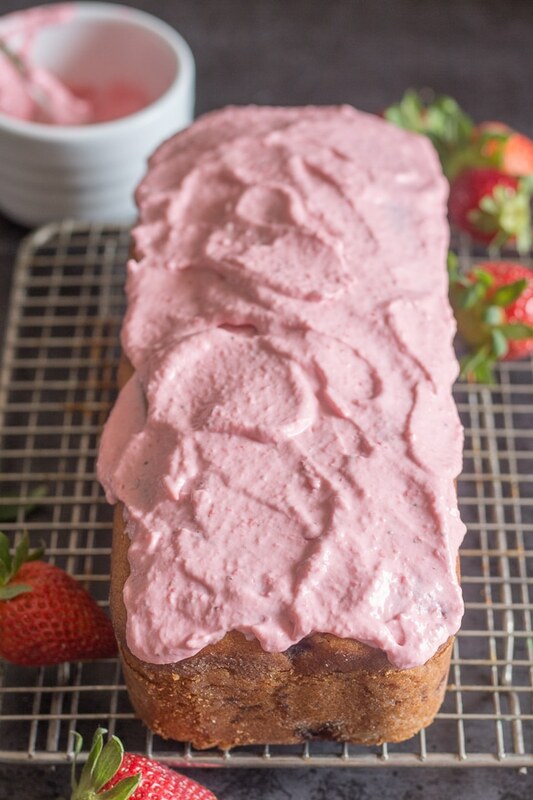 So needless to say this moist Strawberry Bread also has mascarpone as an ingredient, because as you know I love Mascarpone! But don’t forget, last week I posted a recipe on how to make your own Homemade Mascarpone that is not only delicious but saves money too! Sweet Breads make a great quick dessert, snack and why not have a slice for breakfast? I didn’t want one that was over loaded with strawberries, but just enough to give it flavour and moisture. I knew the cream cheese and strawberry frosting would add the perfect touch. The Italian and our friends thought so too. 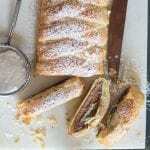 Bake for about 50 minutes, let cool and frost or dust with powdered sugar and serve. So good. 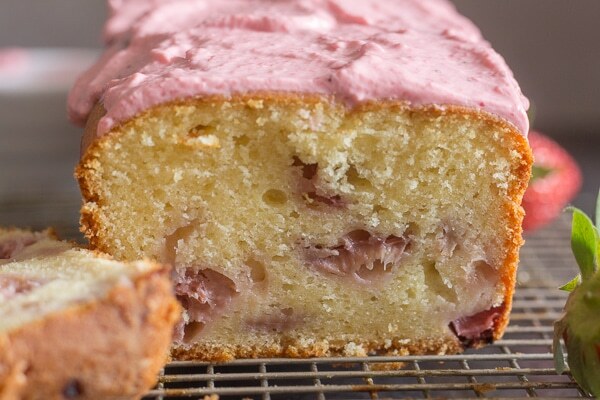 If you aren’t crazy about frosting, this Strawberry Bread is delicious just as is or do as the Italians and add a dusting of powdered sugar. My husband is normally not a frosting lover but this Strawberry Frosting went over big. Not too sweet and with that little bit of tangy taste from the cream cheese and the pureed strawberries it was so good. Whether you have it for dessert, snack or a slice with your morning coffee I hope you enjoy it! 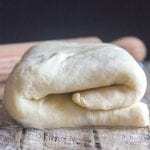 Grease and flour an 8-8 1/2 inch (20-22 centimeter) loaf pan. Pre heat oven to 350F (180C). In a large bowl beat mascarpone and sugar until creamy, then add the eggs one at a time and beat, add oil and beat to combine. Add flour, beat then add baking powder and beat until smooth (1 minute), fold in chopped strawberries. Spoon into loaf pan and bake for approximately 45-55 minutes, test for doneness with a toothpick. Let cool completely before frosting or dusting with powdered sugar. 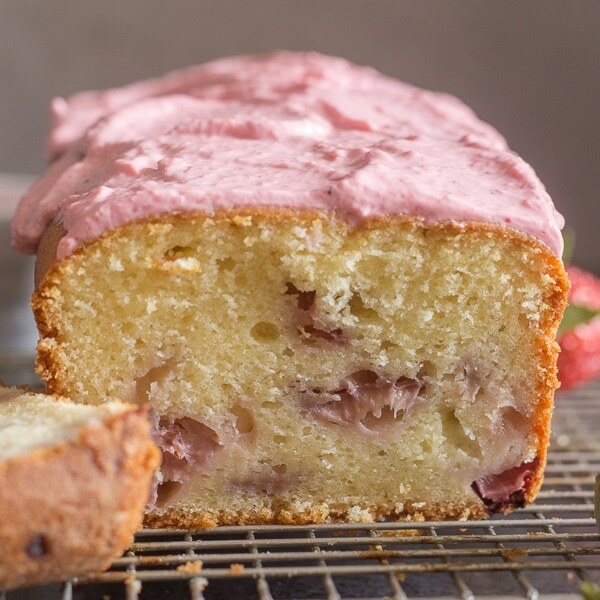 In a blender puree the strawberries and sugar then whisk in the cream cheese, combine until creamy, if you want a thinner frosting then add a little more strawberry puree or a little cream or milk. 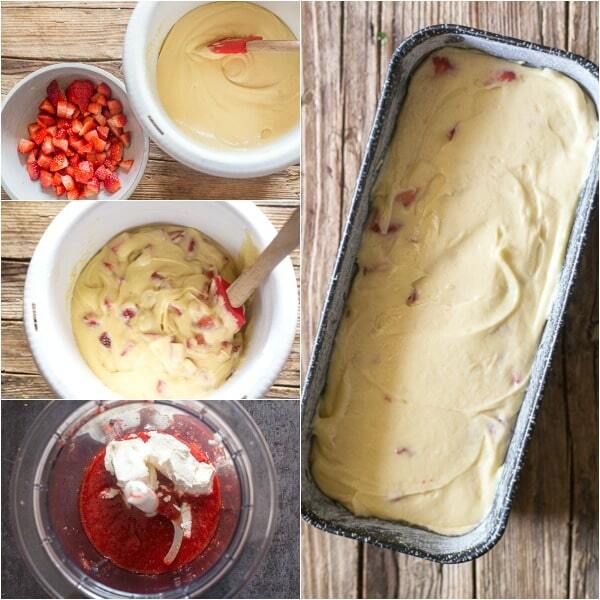 Frost cooled Strawberry Bread. Enjoy. Hi Bert, yes you can, it should work no problem. Hi Martina, Im sure you could replace them with raisins or even another kind of fruit. Do you think vanilla Greek yogurt could sub for the mascarpon? Hi Wendy, I think the better substitute would be cream cheese although you can use greek yogurt but the taste will probably be a bit different. Hope that helps. I have a ton of fresh strawberries that I have been eating like crazy. I’m always on the look-out for new and fresh baking ideas using strawberries. This is one new recipes for me. 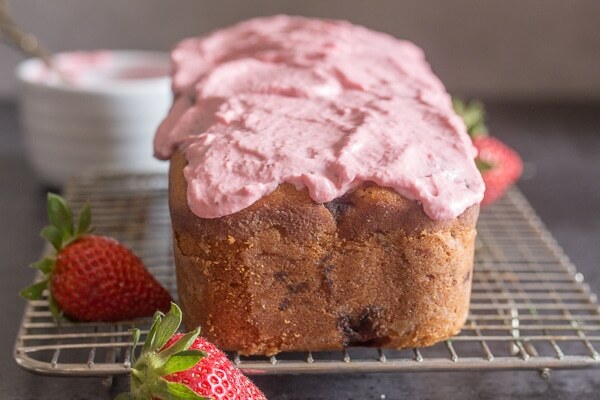 I can’t wait to try it, I adore strawberries and this strawberry bread loaf is right up my alley. I picked strawberries on Monday , found your recipe on Tuesday and baked the bread on Wednesday. 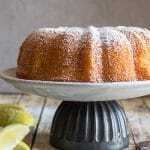 It is delicious!…one of those “forever” recipes that we will make over and over again. It was half gone before I had the opportunity to ice the loaf…..no one noticed…it was just that good. On my next loaf I will hide it until I get the chance to make the icing.! I’d like this recipe however I can’t print it. How can I send it to my email and have someone print it for me. Hi Roberta, at the top of the post underneath the title is an envelope just click on it and you can send it as an email. Hope that helps. Hi Olivia, thanks so glad, let me know how it goes.